What to do after the tutorial? How do I see my character? How big is my inventory? How to get free stuff? How do I travel faster? Do items break? Do boats break? How do I protect against thieving? How do I train magic? Hello and welcome to Syrnia! If you are a new player looking for some practical advise on how to play, you have come to the right place. Below you find a fully comprehensive beginners guide which tells you everything you need to know as a new player. I assume that you already know how to move around, equip a pickaxe and read the manual so instead of stating the obvious I have tried to include information that actually helps you get on track for a successful Syrnia carreer! I have divided the guide into two parts, where the first part covers the essentials, and the second part contains a list of miscellaneous questions and answers that are often asked by beginners. If you're in a hurry or easily bored you can use the index to skip to the part you are interested in. I hope this guide is of use to you and I wish you good luck on your Syrnia experience. You probably already know this if you have come as far as opening this guide, but Syrnia is a text based game, which means it consists of text and images only. Another important aspect of Syrnia is that it is a game of patience. Levelling up your skills takes a long time, especially at the higher levels. Don't let this discourage you however. One of the biggest advantages of playing Syrnia is that you play it while working, studying, or playing other games! You can even play it away from keyboard, which is commonly referred to as AFK. The only thing you have to do is type in the botcheck once every 10 to 20 minutes and wait for the timer to count down. The fact that most players play afk does not mean every aspect of the game can be played this way though. Besides levelling up and trying to get into the highscores there are lots of other things you can do in Syrnia. There are maps and caves to explore, equipment and items to unlock, creatures to fight (alone or in groups), quests to complete, game events to participate in, PvP combat to engage in, and much, much more. Many players also play just to make new friends and chat with others. As the homepage says: you choose your own path of playing. 2. What to do after the tutorial? So you've just finished the tutorial and you've landed in Sanfew, the jailtown of Remer island. While Syrnia has many interesting islands to explore, Remer island is the place where you will probably be spending your first days of gametime. Remer island has 10 locations, at each of which different skills can be trained (an overview of what skills can be trained where can be found under "Remer island walkthrough" below). Which of the 15 available skills you want to train from now on is entirely up to you, but there are few things that I would highly recommend doing when you are just starting out: gathering some gold pieces and constructing a house. See "Which skills to train?" and "Constructing a house" for detailed information on why and how you should do this. It is also never hurts to inform yourself about the game to avoid making mistakes and to give yourself an advantage over other players (see "Other resources of Syrnia information"). Storing your items may seem pointless since your inventory is unlimited, but be warned: when you die you lose all the items in your inventory! Therefore, when you start training combat it is a good idea to store your valuable items that are not needed in combat in a house, just in case. The second reason you need a house (even when you are not planning to train combat) is because you need a place to protect your money from thieves. Anyone at your location can attempt to steal money from you, and it can be very frustrating to see part of what you just earned disappear. By storing money in your house no thief can ever access it. You can store an unlimited amount of money in your house. When you have just started getting the smallest house (250 slots) is just fine. It is a small investment and does not take a long to get. You can build the house by gathering 250 wood, equipping a hammer, clicking "construct" in the city menu and then selecting the 250 slots house. 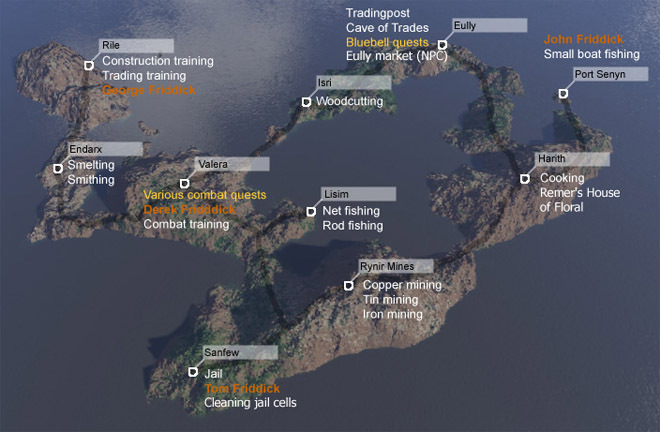 Good locations for a house are Valera (the combat training location and central on the island) and Eully (because trades are conducted there). You can store a total of 250 items in this house (e.g. 200 wood and 50 shrimps). 5. Which skills to train? Generally it is a good idea to train a skill that brings in some gold pieces -the currency of Syrnia- when you are just starting out, because you will need to buy some basic accessories like tools, weapons, armour, food and combat equipment (more about this later). The three skills that provide you with a solid income in the beginning are Mining, Fishing and Woodcutting, so get a pickaxe, net (switch to a rod at level 5 fishing) or hatchet and start working by clicking the link in the citymenu. The resources you obtain are copper/tin ore, shrimps (sardines at level 5 with a rod) and wood respectively, which are used in resource processing skills like smithing, cooking and constructing. Players often choose to level up one resource gathering skill to get a better income, as higher level items are worth more. They then use this income to finance training different skills like magic and thieving, which are expensive to train. While mining, fishing and woodcutting you also randomly obtain items that are much more valuable than the resource itself (see the table). Fishing Leather boots, Locked toolboxes (needed for thieving) and Small chests (click on them to open them). Woodcutting Radish, Beet and Carrot seeds (needed for farming) and Small chests. Once you have obtained a nice load of items you can attempt to sell them to other players at the trading post. As a rule of thumb you can use that you need at least 250 ore, fish or wood before attempting to sell it, as less is not worth going to the trading post for. For useful tips on selling your items, see "Selling your items" below. Make sure that you check what the current market value of an item is to avoid getting ripped off. 6. How to speed up the timers? The base timer of what you are doing is solely depends on the action you are performing (for example mining iron ore has a different base timer than mining gold ore or woodcutting at a level 25 forest). The base timer can not be influenced by players in any way. Generally higher level locations have higher base timers. By levelling up in a skill the timer of the skill you are training will decrease. A level 25 miner will mine ore faster than a level a level 5 miner for example. The timer reduction per level is only a very slight however, and you may not be able to notice it at low levels and locations with low base timers. The third factor that has influence on your timer is the tool you are using. Higher level tools will decrease your timer by a higher percentage. They usually also have higher level requirements, so you will need to level up to be able to use them. Make sure you know at which level you can switch to a better tool so you don't miss out on the extra timer reduction. The last factor that influences your timer is the number of other players working at your location. This is commonly referred to as "Crowding". For each extra playing working at the same location as you (doing the same thing), a few -usually 2- seconds are added to your timer. Crowding has a maximum amount of 15 players adding to your timer, so there is no difference if there are for example 15, 20 or 40 players working at the same location as you. To improve your timer, you simply have to find a location with less players working besides you. If you consider selling your items, there are a few things you need to know. You can either sell your items to other human players or to an NPC market (non player controlled). As a general rule, it is not worth selling your items to NPC's since they pay very little. The only important exception for now are leather boots (caught by fishing), which Eully market will buy from you for 250gp. There are various ways in which you can sell your items to other players. Below you can see the various ways in which you can do this. For new players like yourself the best way is using the trading post in Eully (because it has no extra costs), but it is good to know which other options are available. You can use the market section of the forum and/or trade chat to advertise that you are buying or selling a certain item. 1) Gather a reasonable amount of items (250 is generally good enough) before attempting to sell them. It is not worth walking to the trading post for only a few items. 2) Once you have found a buyer, discuss the details through whispers or messages to avoid attracting thieves. 3) Once you have agreed to a deal, do not back out if someone else suddenly offers more. This gives you a bad reputation and you may miss out on future deals. 4) Build a house at the trading post, so you can store your hard earned gold pieces safely immediately after you have conducted a trade. 6) Read Forum -> Help -> Scam/Thieving protection tips to protect yourself from thieves. New players often wonder what how much gold pieces an item is worth. Since Syrnia's item market almost completely depends on player supply and demand, it can be hard to put a definite price on an item. There are various price lists going around on the forum and fansites to help you with this though. If you are in doubt you can do a price check. You can do this by typing "Price check" followed by the item name in Trade chat, and other players will tell you what they think it's current value is. You also learn a lot about the price of items by regularly watching trade chat. Combat plays an important role in Syrnia, and therefore deserves some extra attention. First of all, if you die (happens when your hitpoints reach 0), all the items in your inventory are dropped on the ground and you respawn in Sanfew. Unlike other skills, combat is divided into four separate skills: Attack, Defence, Strength and Health. Each skill has a different effect on your combat performance. Attack determines three things. First it determines how frequently you will be able to hit for your maximum hit. Secondly, increasing your attack skill also increases your average strike. Lastly, your attack level determines what kind of weapon you are able to equip. The higher your skill, the better weapon you can fight with. Your defense level works to reduce the chances you take damage. The higher your defence level, combined with the armor that you wear works to reduce the chances monsters hit for their maximum, and in the same breath, reduce overall damage taken. The higher your defence level, the better the armour you can equip. Your strength level works to determine your maximum potential hit. Your health level determines how many hitpoints you have (HP). 1) Make sure you have all available Bronze armour (Medium helm, Sabatons, Small shield and Hands) and a weapon (Bronze long sword) equipped. You can buy them from nearby player such. Make sure you have some extra because equipment can break during combat! 2) Have 50-100 cooked fish or vegetables to heal with (you heal by clicking on it in your inventory). Once you have done this, move to Valera and click Training grounds to start fighting. It is a good idea to stick to Rats until you are combat level 10, because they are the cheapest and quickest way to level up. At level 10 you are not allowed to fight rats anymore. At this point it is best to skip Spiders and switch to Gnomes immediately, because they give you better experience and drops! There is a lot more to say about combat, and this is really only the tip of the iceberg. For more information, see "Other sources of Syrnia information". As you have learned in the tutorial you can travel to other another location by clicking on it in the location image. By travelling around this way you gain speed experience and you sometimes find flowers which can be sold to Harith's house of floral (in Harith). Every speed level you gain slightly reduces the time travelling between two locations takes. Walking around can take a long time however, especially on the high level islands. If you want to move around faster you can equip a mule or horse (there are various types) to reduce traveltime drastically. The downside of this is that you will not gain any speed experience or find any flowers while moving. If you prefer to gain experience, there are still ways to move around faster. You can equip boots (again, there are various types) which will lower the time travelling takes by a percentage. Leather boots are the cheapest and reduce travel time by 20%. You can also equip weapons, tools or armour that have a minus travel time enchantment, which will reduce traveltime by a few seconds. This also reduces the experience you gain by a little bit though. Travelling to other islands is different from travelling between locations. Horses, boots or enchantments have no effect on how long travelling takes here, and travelling costs money unless you use your own boat. If you are planning to travel to other islands regularly, is it strongly advised that you get your own boat to avoid paying the overpriced NPC ferry. The cheapest boat is the Small fishing boat, which costs 2000 wood and requires level 20 constructing to build. Due to oversupply boats are worth less than the cost of wood (4000gp), so it is better to buy one from another player than to construct your own. Also important to know if you consider travelling to other islands in Syrnia is that not every island is safe to travel to. From Port seyn you can travel to The Outlands, a PvP area where players can attack each other. There are no level restrictions here, so you are at risk of being 1 hit killed by a high level player! It is best to avoid this until you have obtained a high combat level. Also, some islands (e.g. Serpenthelm and Exrollia) have what is commonly reffered to as "auto attacks". This means that when travelling around there, you are attacked by one of the creatures that lives there. More specifically, this means that each time you arrive at a location you instantly enter into a fight with one of the creatures that lives there, and since you cannot escape from this fight (unless you use an expensive teleport orb), you will have to kill the creature. For this reason you should always inform yourself if an island has autoattacks before travelling there to avoid getting killed. A clan in Syrnia is simply a group of people playing the game together. You can see what clan a player is in by his or her "clantag", which is the symbol between the [ ] shown in the game chat and forum. There are a lot of clans in the game, and every clan has it's own goals, rules and playing style. All clans also have their own private chat and forum. To advance in the game you do not need a clan, but it can greatly improve your playing experience. Once you have played the game for 25 hours, you are able to create your own clan. When you are still this new it is much better to join an existing clan and learn more about the game first though. Players will generally not be interested in joining the clan of a new player, because he has nothing to offer them. If you are not interested in joining a clan it is often a good idea to create your own one-man-clan to avoid claninvites from other clans. As with any game, it is a good idea to read the game rules at least once. In general you will be just fine if you use common sense but it is a good idea to inform yourself about the game rules instead of learning by trial and error. Reputation plays an important part in a small community like Syrnia and breaking the rules may follow you around the rest of your Syrnia carreer. You can open the rules by clicking the "rules" link right next to the chat bar. One thing that requires special attention is that Syrnia has a relatively strict chat policy compared to other games. All chats except clanchat are English only, and the use of inappropriate language (swear words) and topics is not allowed (see section 12 of the game rules for more information). 4) Help chat where your fellow players and guides will be happy to assist you with any questions. 1) How do I see my character? 2) Are there level caps? No, Syrnia does not have maximum levels. At the time of writing the highest level that a player has achieved is 259 in the fishing skill. 3) How big is my inventory? There is no limit to how many items your inventory can hold. 4) How to get free stuff? Begging for free stuff is frowned upon in Syrnia, so I would advise you not to do this. A good way to get some freebies though is by voting for Syrnia. You can do this by clicking on the Support Syrnia link above the left menu. You then have to click on "Vote for Syrnia". Vote on all the sites with the name "top" in them. After a few minutes you should see some green gifts appear in your inventory. You can open a gift by clicking on it! 5) I died. What now? When you die you respawn at Sanfew. Clean the jail cells here for a few minutes until you have enough gold pieces to buy a tool at Eully or from a player shop and start mining, fishing or woodcutting. Sell those resources and use the money to replace the items you have lost. If you choose to fight again, make sure you have a weapon, bronze armour and food to heal! 6) How do I travel faster? 7) Do items break? Do boats break? Tools, weapons and armour can break. Mules and horses can die while travelling. This is random. Boats do not break (or sink). 8) How do I fight? Travel to Valera and click on training grounds. It is recommened that you have full bronze armour, a weapon and food to restore your hitpoints before you start training combat. Stick to rats until you are combat level 10, then switch to gnomes (skip spiders) since they give better drops and experience. 9) How do I thieve? Click on a player name under "players at this location" and a link to thief them will appear. If you fail you will be sent to jail to do some time. You need level 10 thieving to thief items from shops. You can train thieving by opening locked toolboxes which are dropped by Gnomes. 10) How do I protect against thieving? You should store your gold pieces in a house, where no thief can ever get to them. You can build a house by gathering 250 wood, equipping a hammer, clicking "construct" in the city menu and then selecting the 250 slots house. You can store an unlimited amount of gold pieces in your house. Levelling up your thieving skill also decreases the chance that another player successfully thieves you. 11) How do I train magic? To begin training magic you will have to complete the two Bluebell quests. Both quests can be started in Eully. 12) How do I farm? To be able to farm you first need to build a house if you do not have one yet. Once you have a house, equip a spade and click the "Player house" link in the town menu, then click "Check your farmland". You will be presented with the option to purchase farmland. 25 slots of farmland costs 750gp. 13) How do I sell my stuff? Go Eully, where you can sell your stuff to other players at the trading post. You can also sell your stuff to the NPC market here, but this is not recommended as it pays way too low. You can also auction your items here at the Cave of Trades. 14) How do I create a clan? Once you have played the game for 25 hours, you are able to create your own clan. When you are new however it is a good idea to join an existing clan and learn more about the game first.